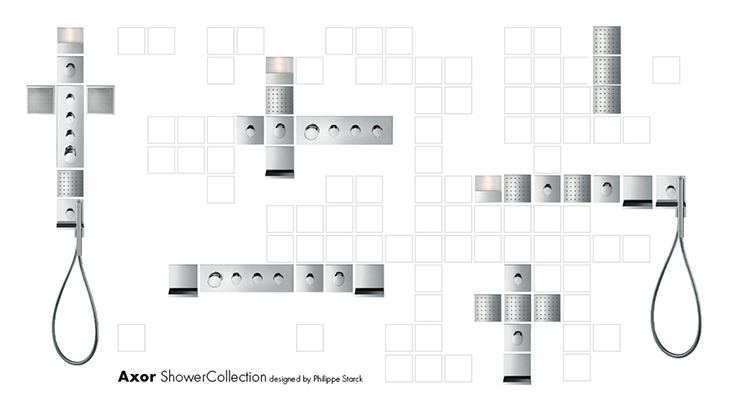 Use the AXOR ShowerCollection to custom design your customer's dream shower. The simple modular system, consisting of showers, mixers and accessories, also provides you with customised, creative solutions for a wide range of different requirements and room scenarios: from standard shower to personal spa. 12 x 12 cm squares, which can be combined to suit, form the basis of the AXOR ShowerCollection. Mixers, functional modules and accessories can be combined in this way to form a customised shower system. Horizontally or vertically, arranged freely or in groups: the sophisticated modular principle offers both freedom of design and easy installation. The AXOR ShowerCollection is extremely reliable and safe to implement behind the wall too, making it truly impressive. The Axor ShowerCollection was created in collaboration with Philippe Starck and perfectly matches lots of the other Axor collections. 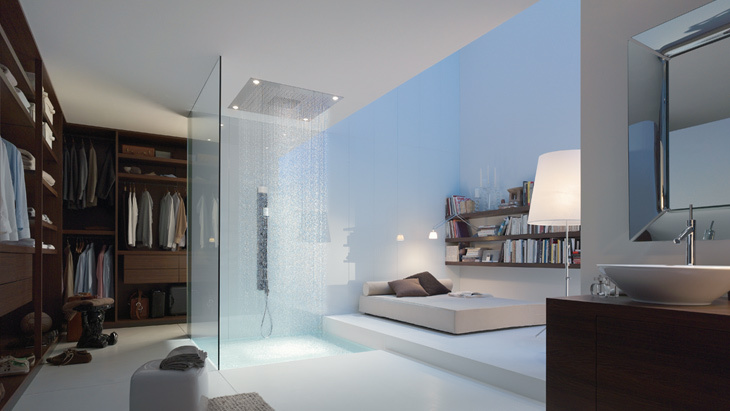 The AXOR ShowerHeaven overhead shower comes in two sizes, with the option of integrated lights. It represents showering luxury – three different jet types included. For smaller bathrooms, the 24 x 24 cm overhead shower offers ample showering pleasure. The 12 x 12 cm shower modules offer further usage options: in the form of overhead, neck or side showers. One of the collection's special features is the multi-functional waterfall spout: it can be used to fill the bath tub, in the shower the flood jet can be used for neck massage and the module can be used as an elegant shelf. Thermostats, diverters and valves are available as individual functional modules, which can be custom-combined to create an intelligent shower system during planning and installation. Completing the range is a matching hand shower module with integrated shut-off valve and bracket for the manual shower. Special base sets enable the individual modules to be installed accurately. The convenience modules for light, audio and shelving provide particular accentuation in the shower. The AXOR ShowerCollection accessories are also based on the typical 12 x 12 cm square, thus they blend in perfectly with the mixer and shower modules. The shelves come in two sizes. Special base sets make installation easier, for example installation of the light and loudspeaker module.